The comprehensive and extensive coverage of Polystyrene, compiled by our team of locally-based reporters gives market players up-to-date and in-depth independent and unbiased pricing information. 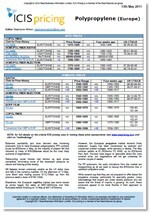 The weekly price assessments are covered in Asia, Middle East, CIS, Europe, the US and Latin America. There are also margin reports and 12-month rolling series reports for Asia, Europe and the US, while the forecast report looking forward a year is for Europe only. Market news and analysis gives the reader the tools required to make essential commercial decisions. Commentary within the reports includes overviews, demand and supply, production issues, feedstock movements and any other factors influencing the market at the time of publication. Supply was tight due to turnarounds in the first quarter. Production loss due to the turnarounds is estimated to be around 3,000 tonnes. Taiwanese producer Taita shut its 100,000 tonne/year PS plant for a week from 4-11 February while Vietnam Polystyrene shut its 50,000 tonne/year plant from 1-10 February. Demand was healthy during the first quarter due to buoyant consumption from the downstream electrical appliances sector. Market participants attributed robust restocking by the television manufacturers as key in supporting polystyrene demand. European polystyrene (PS) supply has been tight throughout Q1 2019. Availability tightened due to post year-end restocking and pre-buying activity amid anticipation of rising upstream costs in the months ahead. An upstream cracker outage in March was also said to have impacted Trinseo’s high impact grade production at one of its plants in Germany, leading to further tightening for that month. Demand for PS in Europe has been very strong in most regions during Q1 2019. Post year-end restocking in January and pre-buying activity throughout the quarter due to expected price hikes upstream ensured buying appetite remained strong. Pre-Brexit stockpiling in the UK and Irish markets in February and March further spurred demand with orders increasing by around 20% in the UK market during this time period. Polystyrene (PS) supply declined in Q1 with shortages of styrene monomer in Brazil. Production declined also in Argentina, where slow demand has forced reduction of operating rates. Production has been normal in Colombia and Mexico, but also at reduced operating rates to accommodate demand. Polystyrene demand declined in Q1 2019, as buyers sought to hold purchases while waiting for prices to hit bottom. Demand fell in Argentina with the steep currency devaluation experienced in recent months. This situation continues with higher inflation and reduced credit availability. Polystyrene supply was deemed balanced in the first part of Q1 amid a seasonal lull. Market players were mostly monitoring the feedstock styrene monomer (SM) market, whose inventory levels kept reaching new heights. In the later part of Q1 2019, Asian supply tightened on the back of improved demand in Asia, with very limited material left over for the Middle East and India. However, regional suppliers in the Middle East and south Asia were able to cover the tepid demand in their regions. Demand was very tepid in the Middle East and south Asia early in Q1 amid a seasonal lull. Buyers typically bought from their regional suppliers on a hand-to-mouth basis. Furthermore, in India, as the financial fiscal year end in March drew nearer, imports became muted. During the latter part of Q1 2019, demand in the Middle East improved a little as buyers prepared for the upcoming Ramadan season in Q2 2019. More transactions were heard, especially for general purpose polystyrene (GPPS), which is typically used in food packaging/disposables. US PS demand increased in the first quarter, largely because of low demand seen in the previous quarter. We offer the following regional Polystyrene analysis and news coverage to keep you informed of factors and developments affecting prices in the Polystyrene marketplace. 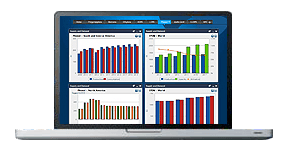 Price forecasts – Concise monthly forward-looking market outlook reports, detailing prices, supply & demand and trade for the next 12 months. 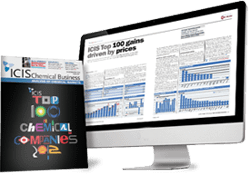 Over 25 years of reporting on key chemicals markets, including Polystyrene, has brought global recognition of our methodology as being unbiased, authoritative and rigorous in preserving our editorial integrity. Our global network of reporters in Houston, London, Singapore, Shanghai, Guangzhou, Mumbai, Perth and Moscow ensures unrivalled coverage of established and emerging markets. The diagram below shows the main method of making polystyrene (PS) from naphtha, a product mainly derived from crude oil. Ethane (or naphtha) with steam is fed into the cracker unit where ethylene and co-products (propylene, butadiene, benzene, etc.) are made. The ethylene and benzene from the cracker are then further processed (catalytic alkylation) to make ethylbenzene. Polystyrene (PS) is a clear, crystalline resin which burns with a sooty flame. It is soluble in cyclohexane (CX), ethylbenzene (EB), ethyl acetate (etac), carbon disulphide, but insoluble in ether, acetone, phenol and saturated hydrocarbons. Two main types of PS are produced: crystal or general purpose polystyrene (GPPS) which is a clear, amorphous resin with good stiffness and electrical properties but it is brittle; and medium and high impact polystyrene (HIPS) which contain varying levels of polybutadiene to improve toughness and impact resistance. Polystyrene is used in a variety of consumer and commercial products with major applications in domestic appliances, construction, electronics, toys and food packaging. Included in food packaging are food and dairy containers, closures, lids, produce baskets, vending cups and fast food containers. Asia as the driving force: Are we moving towards shifting market dynamics? How can we best navigate the volatile butadiene industry despite forecasting difficulties, price unpredictability and numerous other factors? During this turbulent period of significant change in the Asian market, what does this mean for you and your company moving forward? As the dominating market in SBR and other derivatives, join us at the ICIS Asian Butadiene & Derivatives Conference (18 – 19 June, Singapore) and take this unmissable opportunity to meet all key industry players under one roof from across both the Asian and the global industry.